NEW YORK — A small kettle of coffee spiced with sugar and cinnamon steeps atop a gas griddle nestled carefully in a shopping cart. 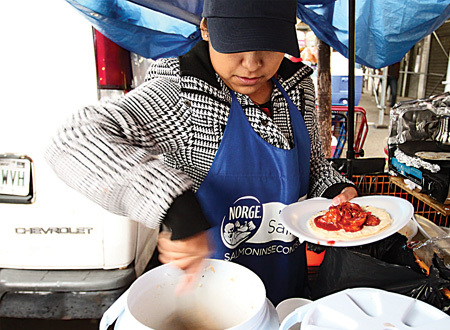 Yazmín Ortega, wearing a houndstooth coat, an apron and a baseball cap, adeptly flips a corn tortilla. She fills the taco with guisado, adds a dollop of red salsa and, with a shy smile, hands it to her customer. Along 116th Street, the epicenter of East Harlem’s Mexican community, shops advertise red-white-and-green long-distance calling cards, foods like tamarind and dried hibiscus, and CDs sporting the visages of Los Tigres del Norte, the popular Mexican-American band. New York City has experienced huge growth in its Mexican population, changing the nature of long-established neighborhoods like East Harlem.